For anyone wondering whether to grind that plane, or whether is it even good, the next few rows are for you. I've managed to get it after cca. 16 hours of playing (not in one go, of course). But that is because I've got a lot of planes that made some missions very easy (mission 29 - 5 HF kills in J8M was EZ) and some of my planes are fully spec'd. Did I buy any tokens? No need to. But I understand that for example McCampbell's medal is challenging to hunt for. How the grind affects gameplay? Very! And not in a good way. Some missions simply force you to do stupid things and even going for the loss just for sake of having the mission completed. Therefore, sorry for possibly throwing away a win or two for the team. BV P.203 - how does it stack to Do 335 or Me 262? Dornier has worse armanent and has no rear gunner and is slower, but on the other hand carries 4 bombs, has better roll rate and boost speed. 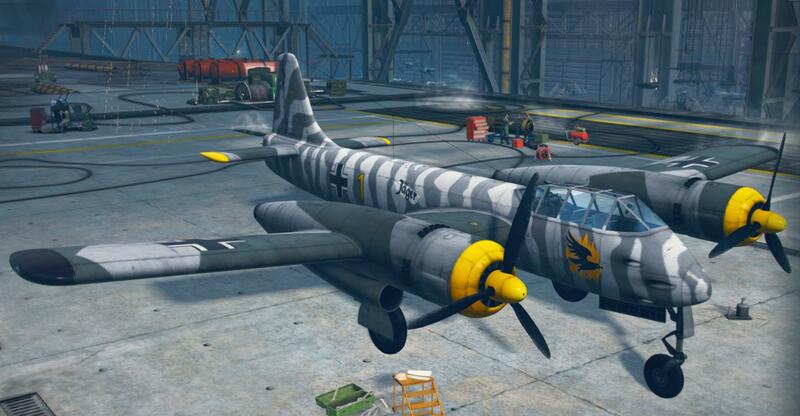 Me 262 is much fater and has same-caliber guns making overheat micromanagement better. BVP has better range on main and secondary gun. Also the shell velocity on BVP is much more comfortable. Armanent, good boost, 3115 ft range on 30mm cannons, Long boost. Cannot boost away from other HFs, huge size and vulnureable engines. Roll of rate is very limiting even in HF territory. Absolutely. Although it is not very much different from Do335, it is comfortable plane to fly. Edited by PoliticallyIncorrectName, 02 February 2019 - 10:15 PM. I was wondering if it truly was going to be worth the grind. Unfortunately I don't have the spare time to spend 16 plus hours and I don't want to spend any money to acquire the necessary certificates to complete the challenge. But, I'm sure there are others who will appreciate your diligence. My status is "Senior Airman". Is that because I'm old? Thanks for the write-up . It helped me decide not to bother. I already have the DO-335, time-limited marathons burn me out, considering it would probably take me twice as long to complete them . Wish it was more like the current Vampire quests with no time limit . Best of luck to those that are going for it! You can extend for tokens. 5 to buy in, each four-day extensionis 3. Edited by sandtiger, 03 February 2019 - 04:48 AM. I'll be saving my tokens for the vampire then. I may pick it up if it comes out later. im not really pressed for ANOTHER tier 8 premium Heavy. Either is sufficient at Balancing those pesky RB-17's flying about and still have the speed to keep up with flipping cap zones. I like my Do 335 well enough. Its agility really shines when your turning gear is advanced.. Even though it IS undergunned for its tier. That ordinance really makes up for a lot when used well. Edited by wylleEcoyote, 04 February 2019 - 09:46 AM. I also have all the ultimate gear fully calibrated (From the event rewards) and the reward pilots which might umm.. just mildly modify things hugely and I appreciate that. Still though, I kinda like it. I dunno why, god help me, its ugly and it doesn't fly well and the turret is practically pointless..... but it's -fun- and because it's T8 it produces decent-ish coinage. Weird question though.. with the mixture of guns on it.. is Universal ammunition actually the best for it since it gives "meh" bonuses to all types or would you say fragmentation ammunition still? I am evil. I took the Historical Period II Special Project of Germany Gas-Operated Action I won and slapped it on my SE-100.